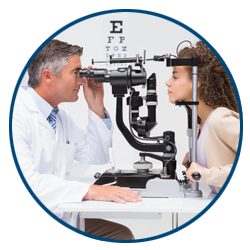 Astigmatism is a common corneal irregularity which causes refractive error in vision. Astigmatism causes blurred, sometimes distorted, vision. An irregularly shaped cornea or lens prevents the light from focusing properly on the retina, which is the light-sensitive surface at the back of the eye. Because of this, vision becomes blurred at any distance. This can cause eye discomfort and even headaches. 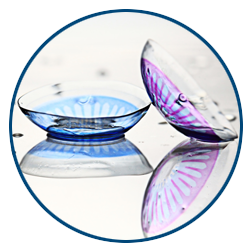 In order to correct the effects of astigmatism, contact lenses were developed that help the eye to properly reflect light onto the retina. This can be done with eyeglasses, but contact lenses for astigmatism tend to be a more popular choice. May people still believe that because they have astigmatism, they cannot wear contact lenses. This is far from the truth! 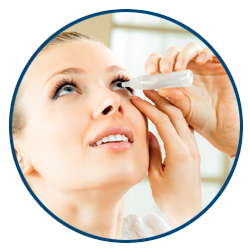 Many different types of contact lenses have been developed specifically for those with astigmatism. Toric lenses have different powers in different meridians (sections) of the lens. This allows the lens to correct the varying amount of nearsightedness or farsightedness in the different meridians of the eye that create astigmatism. 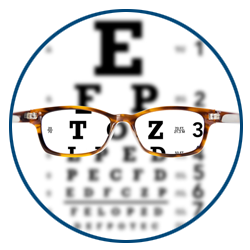 Toric lenses are designed to rotate to the proper orientation on the cornea, allowing the power meridians to align with the appropriate meridians of the eye, ensuring clear vision. 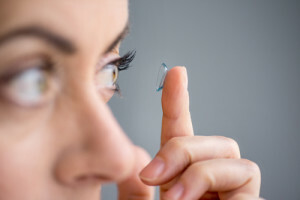 Contact lenses that only correct nearsightedness and farsightedness have the same power throughout the lens, allowing them to rotate in any orientation with no effect on vision. Because every set of eyes is unique, it may take trying a few brands of toric lenses to find the perfect fit for you. 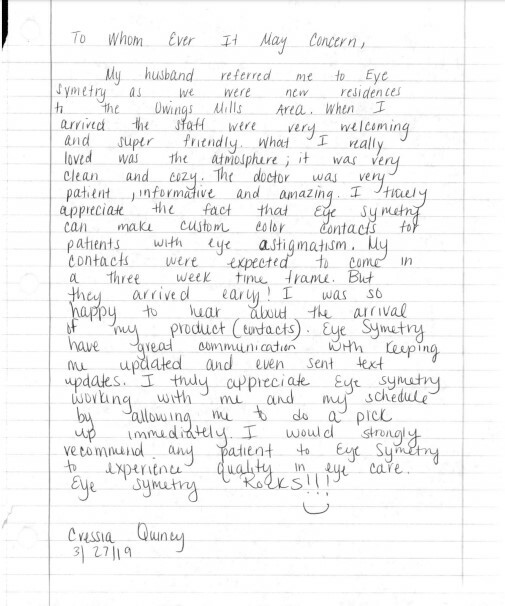 If you are looking for the perfect contact lenses to help you live a life free of blurry vision, call Dr. Schwartz at EyeSymmetry serving the greater Baltimore area for your appointment today!